The latest talk in Suriya Gallery’s ‘Art and Ideas’ series was given recently by Jacqueline Suter from Gold Leaf; appropriately entitled, Hide and Seek...Social Commentary in Contemporary Burmese Art. Jacquelyn has been involved with Burmese contemporary art since 2005. At that time, she formed Gold Leaf, a project to bring the best of this art to regional and international awareness. She is also a nominator for the country of Burma for the Sovereign Asian Art Prize. 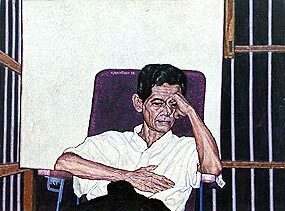 In 2006, she organized Thailand’s first major showing of Burmese contemporary art at the Mandarin Oriental hotel in Chiang Mai, which resulted in both foreigners and Thais getting their first viewing of a selection of modern and contemporary art from a country that many had understood to produce only traditional art. Since that time, the art scene has changed and progressed enormously to include first-rate new media work. In her talk, Jacquelyn focused on how the Burmese artist expresses social commentary by walking a fine line between avoidance of censorship and, yet, communicating fully to the viewer. She also showed us some of the most recent new media work being created in the country which is increasingly getting more regional, as well as international exposure. When an art exhibition in organised in Burma, a censor must be brought in to examine all the exhibits before the opening is allowed. Anything which is deemed to represent sensitive subjects or political comment, or which, in the censor’s opinion, reflects poorly on his perceived image of Burma or its government, must be removed. Thus, artistic freedom of expression and comment through the medium of art is seen to be suppressed. However, artists, being the unconventional and imaginative human beings that they are, have, over the years, developed their own ways of circumventing such censorship, by subtly representing their feelings and concepts in manners that do not alert the mostly inexperienced censors to their intent. Even so, commercial galleries in Burma do not show multi-meaning political and social commentary art works, as they are considered not ‘commercial.’ For obvious reasons, during her talk and her showing of a number of Burmese paintings on screen, the names of the artists themselves were not mentioned. The first painting presented shocked the audience of 20, seated outside the gallery in the cool night air. The title of the painting was Air Pollution. The subject: two men, portrayed head and shoulders, wearing gas masks. But these masks also covered the men’s eyes and mouths with a gauze-like material. The double meaning was obvious to viewers brought up within the concept of freedom of speech. The second painting’s meaning was more subtle. A blue-grey background with parallel vertical lines, combined with a number of small bright yellow and white flowers. On closer inspection, however, the vertical lines were seen to be lengths of barbed wire, with the flowers placed above, actually on or below the sharp spikes. The title of the painting was All the Little Flowers. Again, the interpretation was inescapable. A pretty picture with a deadly message. 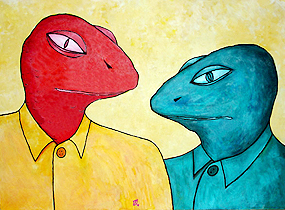 Burmese artists often use unpleasant depictions of animals as a way of representing the ruling Junta. A painting entitled Monkey Business had exactly this double meaning and a cartoon-like feel. Talk – two strange, threatening beasts in conversation, again brought the nature of the ruling Junta immediately to mind. Another, picturing a piece of wood with water drops running down, entitled Mar Mar, was an instant reminder of tears to Jacqueline’s fascinated audience. A realistic painting entitled Tibet showed a group in Tibetan costume gazing with resigned expressions and poses across Tiananmen Square in Beijing at the huge picture of Chairman Mao high over the portal of the Hall of the People. The comparison with the repression of the people of Burma was, again, inescapable. The last painting shown, a brilliantly executed but, sadly, deteriorating canvas depicting the artist, seated with a backdrop of a blank canvas and bars to each side, said it all. The expression on the artist’s face invoked an intense feeling of compassion and helplessness. In the final part of her talk, Jacqueline covered both photographic art, increasingly accepted as a viable art form in Burma, and performance art, also used for political and social commentary, but usually performed in private galleries as street performances are far too dangerous for the artists. Installation art was also mentioned, again with its political and social dimensions. More difficult than paintings for censors to judge due to its interpretative nature. An interesting example showed household objects, vases, plates, etc, arranged around a space and on the walls. All wrapped in black cloth, waiting to be freed from their coverings and in use again. A thought-provoking and often shocking lecture. Giving all of us present many reasons to re-examine the essential nature of free speech and expression to the human race’s emotional health, survival and development. A great idea! Let ArtSpace on 7 entertain your kids during the long holiday, and stimulate their creativity at the same time! ArtSpace on 7 are holding informal classes for youngsters aged 5-6. The fun and games will begin with a unique art project, making Chinese paper dragons, leaf prints and torn paper flower bouquets. A short break for a snack will follow, during which the kids will be entertained by Bradley Dean Whyte. Parents are asked to provide their kids with a snack and a drink. The class will end with ‘music time’ – singing, dancing, and interactive demonstrations from Bradley’s assortment of musical instruments and world percussion instruments. Kids can take home their creations, and are sure to have a toe-tappin’, finger-paintin’ good time! Classes will run every Monday during May, beginning at 10 a.m. The fee, including materials, is 2,400 baht. ‘Essentials of the Still Life,’ a 5-day painting workshop headed by ArtSpace’s Laura Spector, will take students from beginner level to intermediate, reviewing the techniques and materials used to paint a still life. Participants will learn composition, colour palettes, reflective surfaces, how to paint fabric and light and texture. The workshops will also look at the history of still life painting. The masters, modernists and contemporary artists utilizing the still life in their work today. All students will leave with sketches, 2 paintings and materials to continue painting on their own. The fee, including all materials, is 6,000 baht. For further details, or to reserve a place, please contact Laura or Bradley on 085 622 6607, or visit the website at www.artspacechiangmai.com. Readers interested in Thai traditional arts and performances have a rare treat to look forward to during the last week of this month…a collaboration between Chiang Mai’s Wandering Moon shadow puppet theatre and Vasin Mitsupun, a string puppet artist from Bangkok. A reworking of a beautiful modern Australian children’s book, The Red Tree, by Shaun Tan, will be performed, using both shadow and string puppets. Both children and adults will be captivated by the story itself, and by the artistic and inspirational sets and props. Wandering Moon, founded in 1999 in Chiang Mai, has actively worked to develop contemporary shadow theatre as an art form and as a medium for social change with a focus on environmental issues. The company employs a mix of shadow theatre, film and songs, using puppets and live performers. It is not government or municipality funded, and relies on donations to continue its work of preserving, promoting and developing this ancient art form in a modern and meaningful way. Traditional shadow and string puppet shows have featured in celebrations across South East Asian for hundreds of years, with Thai shadow puppets being one of the best-known examples of the craft. This unique form of story-telling originated in villages in the south, and quickly spread to the rest of the kingdom. The puppets used are intricately cut, delicately coloured and articulated strips of dried buffalo hide, manipulated with rods and shown against a white background with light shining from behind, so that they appear only in shadow. Performance themes are usually religious, with many tales taken from the Ramayana epic. However, other tales may be specially written to contain songs, poems and texts concerning current local events of interest to the audience. Hundreds of different characters are represented, but puppet shows will almost always include a clown, a scatter-brained old woman or a stupid local yokel. All highly appreciated by the audience! Puppet masters make the puppets and write and perform the poems and songs, using many different voices. Such puppeteers are highly regarded for their expertise and talent, with a number being recognised as National Artists. Classical court puppets, carved from wood, beautifully dressed in embroidered and beaded traditional costumes and operated by bamboo rods or a complex system of cords attached to brass rings on the puppeteer’s fingers, originated in the 11th century and were the prerogative of Royalty and the rich, with elaborate performances taking place over several days. Dances and gestures from traditional Thai opera were used, as were ancient tales and legends. However, in the early 20th century, these skills were almost entirely lost, when the kingdom’s most famous puppeteer, master Khrea, noting the wane of popularity in his art caused by movies and modernity, gave his most precious puppets to his wife, threw the rest in the river, and cursed anyone who wished to continue with the art form. Stating that he wanted the craft to die with him, he almost succeeded in its destruction due to the superstitions of its other practitioners. One man, however, a former child actor in the master’s original travelling troupe, saved classical puppetry from disappearing altogether. After the master’s widow died, leaving him her late husband’s finest creations, master Sakorn began crafting his own puppets, and revived the tradition in full. In 1996, he was named a National Artist, and died in 2007, having, in 1985, founded the famous Joe Louis Puppet Theatre in Bangkok as a development from his puppet troupe, popular since World War 2. Performances will take place at the Thepspiri Gallery, located at 100/4, Soi Wat Umong, off Suthep Road opposite CMU, and will begin with the premiere on April 24, for which admission will be free, with donations welcomed. Further performances will take place daily April 25 through 29. Tickets at the door will cost 50 baht. A final find-raising performance will be given on April 30, with suggested donations of 100 baht. All performances will begin at 7 p.m.
For further details, please call on 053-904-076, email on [email protected], or visit Wandering Moon’s website at www.wandering moontheatre.com.